For generations, olive oil has been lauded as an all-around essential for natural skin care. This dynamic, antioxidant-rich oil moisturizes and nourishes everything from chapped lips to cracked elbows. While olive oil is great for overall skin care, its minerals and fatty acids particularly help plump up the eyes and give dark circles a little glow; vitamin K helps as well to normalize skin tone under the eyes. Although olive oil won't instantly remedy dark circles, regular application helps reduce their appearance over time, and you might just enjoy some additional skin-friendly benefits along the way. Pick up some high-quality extra-virgin olive oil. (Avoid pure or light olive oil, which are sometimes chemically processed.) You'll only use a little bit per application, so a good bottle lasts a long time. 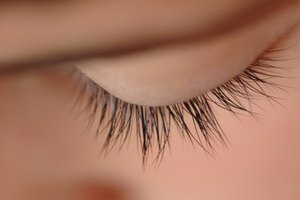 Remove eye makeup by infusing some olive oil into a cotton ball and gently swiping that over your eyelids and eyelashes. Wash any remaining makeup or oil residue from your face with a pH-balanced face wash of your choice. Coat the tips of each of your ring fingers with a drop of olive oil. Gently massage the oil into the under-eye area without getting any oil into your eyes. The oil should not drip or leave a thick residue; use just enough to leave the under-eye skin feeling soft and smooth. Repeat this routine daily to lessen the appearance of dark circles and fine wrinkles over time. Extra-virgin olive oil offers lots of beauty benefits—combine it with a bit of coarse sugar to make a lip scrub, apply it generously to your hair and scalp as a 20-minute leave-in pre-shampoo treatment, or use it as a cuticle conditioner. AARP: AARP Blog: Better Beauty With Olive Oil? Yes!